FREE SHIPPING to the lower 48 states. Please contact us here if you are outside this area or if you need a price quote on multiple items. If you want to arrange for pickup, please contact us for discount prices. 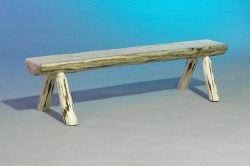 Similar to our Half Log Bench but without all the weight, this plank style bench is handcrafted from solid pine. The top is a solid panel of edge glued pine boards. After laminating, the panel is sanded with different grits of sandpaper going from course to fine, to give it a very smooth finish. The log rails are solid lodge-pole pine and attached to each other with the trusted mortise and tenon method. Dimensions are: 6' L x 12"D x 18"H... Seat 11-12"W Base-legs 17H 14W. These benches are made of actual half logs! The seat is around 12" wide. Constructed of solid pine, these sturdy benches are sure to last for generations. The large pine log has been cut lengthwise with holes drilled at an angle to accept the log legs. 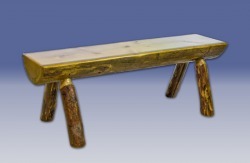 Half log bench is available in 3', 4', and 5' lengths. 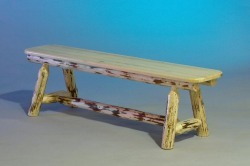 Can be used for seating anywhere, at the dining table, at the foot of your log bed, or on the deck! Dimensions: Seat 11-12"W Base-legs 17H 14W. 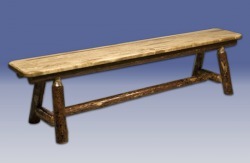 Shipping is Included in These Half Log Bench Prices!